Several of my pre-med biology students have asked me about Gunther von Hagens' exhibit "Body Worlds," now touring the country. Since we offer cadaver dissection as part of our undergraduate courses in human biology, I guess my initial reaction was "Hmm, sounds educational; I guess that's alright." Mind you, I had not seen the exhibit. Now, having viewed images from the Body Worlds Web site, I've changed my mind, and I'm downright uneasy about this new brand of voyeurism. 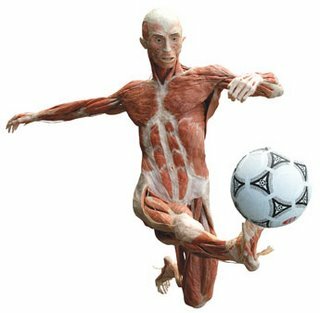 Body Worlds is a an exhibit of plastinated human cadavers that have been completely dissected and posed in "artistic" positions. The Web site touts the result as "edutainment," but may seriously violate human dignity in the process. Take, for example, the remarks of bioethicist Ruth Levy Guyer, whose invited commentary appeared on National Public Radio's All Things Considered on August 12th. After visiting the exhibit, she asks the question, "Do we really need to entertain ourselves with dead bodies?" Guyer describes one such "artistic" pose: an athlete with arms outstretched, holding a ball in one hand and his internal organs in another. Guyer is amazed that people can so casually pass by the figure of "a recumbent partially-dissected young woman, with her partially-dissected fetus in-situ." Such unnatural poses seem to show a real disrespect for the dead, and for the living human beings they once were. It gets worse. As reported on the NPR Web site, reporter Neda Ulaby documents that the cadavers may not all come from ethical sources. Some are obtained from China. Dr. von Hagens claims that he only uses sources he trusts, yet "no outsider has verified that they might not be, in a worst-case scenario, dissidents killed in a Chinese prison." At the very least, it appears that the science centers who exhibit these displays may not have subjected the matter to much ethical review. Several classes will take advantage of a unique resource: a human cadaver. This specimen will help us to more effectively learn human anatomy. The impulse that led this gentleman to donate his earthly remains for our study is a noble and generous one, one that we should all appreciate . . . The cadaver should be treated at all times with great respect. It should never be given a name, but should be referred to as "the specimen" or "the cadaver." The cadaver should never be posed or placed in an undignified position. The contrast between our respect and appreciation for the human form and the exploitation of exhibits like Body Worlds should be abundantly clear. Utilitarian attitudes are more and more taking the place of the sanctity of life. An important signpost of this change in focus is seen in the way we treat our dead. Thank you for making us aware of this egregious assault to human dignity. I also appreciate learning of the sensitive way cadaver specimens are handled in the classroom. I just went to see BodyWorlds3 in Portland. I thought it was actually well done and plenty of respect was paid. They showed us a copy of the consent form that people sign to donate their bodies to such a program. Yes, it was partially described as art and partially as educational. I think that the human body is a beautiful thing and it may even lead people to worship God more when they see how amazingly it is built. I also thought it was great that they brought the kind of educational tools that traditionally only medical students have held to the masses. Most of the people who were there are the kind that are genuinely interested in the subject but never had the opportunity to take such a great class as Structure and Function. What a difference one's perspective makes! Those who commented (as well as others who have spoken to me about this) have divergent views on the BodyWorlds project. I'm sympathetic to the viewpoint that sees this as educational. I guess I still have a problem when things go "over the top" to make this a voyeuristic exercise in art. My thanks to those who offered their comments.